He is traditionally followed by the incumbent president and an ex-prime minister. 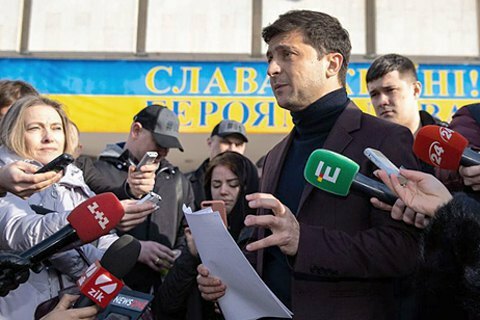 Volodymyr Zelenskyy, comedian and leader of the Servant of the People party, is still in the lead in the presidential run ahead of election day on 31 March, a poll has shown. "Zelenskyy is in the lead among presidential candidates with 24.9% of all respondents wanting to vote for him and those who intend to go to polls," a survey conducted by the Rating sociological group revealed. Some 18.8% of respondents support ex-Prime Minister and Fatherland party leader Yuliya Tymoshenko, while 17.4% are in favour of incumbent President Petro Poroshenko. The head of the Opposition Bloc, Yuriy Boyko, has 10.2% of votes, Civic Position leader Anatoliy Hrytsenko, 9.4%, Radical Party leader, Oleh Lyashko 5.8%, Opposition Bloc MP Oleksandr Vilkul, 3.5%, independent candidate, Ihor Smeshko, 3.1%, and a senior member of the Freedom party, Ruslan Koshulynskyy, 2.2%.